Volleyball positions and techniques for playing those positions effectively. The setter is considered to be the most important position in volleyball. The setter on the team is the leader. Just like a quarterback in football, a setter in volleyball is in charge out on the court. The setter is the team leader that's involved in every play. As volleyball positions are concerned, setter is a critical position that doesn't get the accolades or reap the awards that big hitters do. Fans usually don't notice the setter on the court, but the setter is usually the primary reason a spiker can hit the ball to the floor. Setters do what the name implies: The setter sets up their teammate for an attack. How well your team plays usually depends on how well your setter plays. Most teams have players that specialize in passing. These players are called defensive specialists. The forearm pass is a very important skill defensive specialists need to master. Without the pass, the setter can't set an attacker. The basic strategy for winning in volleyball is getting an attacker a great set from a setter. This can't happen without a pass. The better you can pass, the better you are at sideout volleyball. When your opponent is serving, you want to sideout to score a point and keep your opponent from scoring the point. A sideout is a successful pass, set, hit that results in winning the rally. The sideout is basically when you earn the serve back. Recent rule changes have allowed players to take the serve using an overhead passing motion that involves using the fingers to direct the ball. Basically, the rule says that on the teams first team contact, a player is allowed to double contact the ball as long as contact is made during a single attempt. So basically, when the other team serves the ball, you can legally double contact the ball with your fingers when playing it with your hands. This rule has change the philosophy for coaching how to pass a volleyball. Many coaches have elected to train their passers to pass using an overhead open hand setting motion. Other coaches still disagree and think this isn't the best way to pass and don't allow there players to pass the serve overhead. The server is the player that stands at the baseline with the ball and on the referee's beckon, tosses the ball up into the air and hits the ball over the net to put it in play. The serve is important because it's the skill for putting the ball into play. Serving begins a rally and without a serve, the ball can't be put into play. Many coaches take serving for granted and don't realize how important serving is. The serve should be seen as an opportunity to create an advantage for your team. For example, as a server, if you intentionally serve the ball to a player that you know is the weakest passer on the team, then you are more likely to when the point. Serving strategy is important when it comes to winning in volleyball. Serving is the only skill in volleyball that a player has complete control over because no one else touches the ball before the server does. On the other hand, nothing deflates momentum more than a service error. So you can see how important serving well is. Of all the volleyball positions, the skill that everyone enjoys the most is spiking. Spiking is also referred to as attacking or hitting. Nothing is more dynamic in volleyball than spiking the ball. For the average fan, the player that can hit the ball the hardest is the crowd favorite. Many players gauge their performance on how well they are hitting. In volleyball, blocking is considered to be the first line of defense. A blocker wants to stuff block (block the ball down into the opponents court) or deflect the ball in some way. The ball could be deflected towards the opponents court with hope of keeping it in play, or a blocker may try to deflect the ball to a teammate in hopes of keeping the ball in play and eventually win the rally. Blocking is such a difficult skill to learn, many coaches don't spend much time teaching it. Especially in youth volleyball, it may not be worth time spending on because if you aren't that good of a blocker, at that lower age level it won't hurt your team. On most club teams (kids younger than 14) blocking just isn't that big of a factor when it comes to winning. At more advanced levels of play, attackers are taller, more skilled, and ball control is much better. This is when blocking becomes more important. Any player of any size can learn to effectively dig volleyballs. We know how much fun it is to spike volleyballs real hard, but nothing is more fun than digging one of those hard spikes. 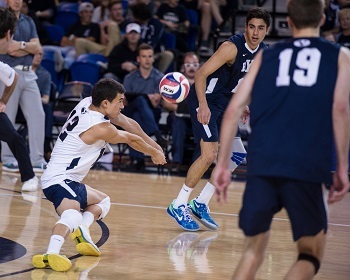 One of the key volleyball positions in volleyball is the libero. The libero position was initially added to provide a unique position for smaller players. Today, the libero is a unique and important position that's played by players of many different sizes.